Is it possible to find a shepherd in Denmark? 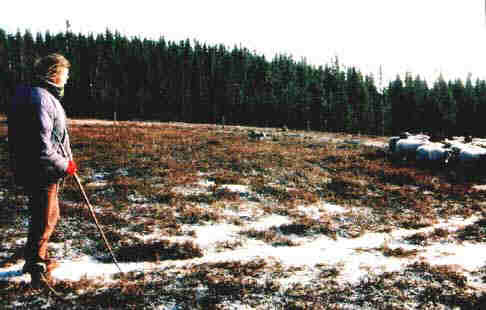 In the triangle between Ørnhøj, Ulfborg and Holstebro there is an open space and deserted heathland, this is Ulborg State Forest. For the last 25 years the State Forest has chosen sheep as a form for heather conservation. The sheep graze the trees and bushes, such as Asp, Willow, Birch and Pors, but also self-seeded trees such as Pine, Broom and Rowans. In the winter the tough sheep mainly graze the heather. The sheep are very independent, with a good appetite for trees, grass and herbs. The choice of breed is a selection of the nordic landraces. Jutland heather sheep (=Lüneburger in Germany), Gute sheep (Old Swedish) and Spelsau (org. From Norway). This year (2000) there are 410 ewes. The sheep graze in different pastures and in a mobile fence system. The total heather/meadow land for sheep is approx. 300 hectares. "A big waving wool rug in natural colours white, grey, brown and black- a flock of sheep being moved by sheepdogs- Bordercollies on command from a shepherd". A beautiful vision that a lot of visitors have been lucky to see. Although the picture is in the present, thoughts go back in history, where the sheep was the oldest animal on the farms, being decisive for human survival. The sheep gave skin, telle, meat, wool and milk. A piece of culture and wool tradition which in this high-tech community has almost been forgotten. - Yes, there is a shepherd in Denmark. 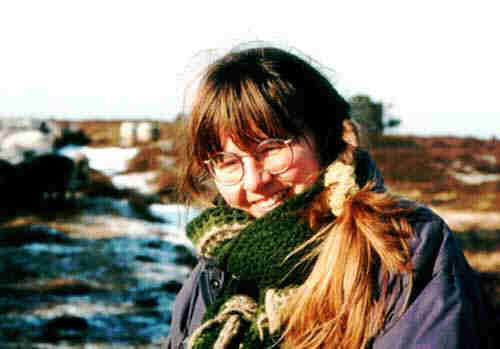 Her name is Berit Kiilerich, she is schooled in England in sheep management. She has since 1988 worked as a shepherd on Ulfborg State Forest with responsibility for the sheep flock + all of the jobs involved in sheep husbandry. The job includes feeding especially when there is a lot of snow; sheep shearing, lambing, foot care, grazing, planning, water and minerals, distribution, lamb sorting, breeding work + registration, sheepdog demonstrations, showing sheep and dog tricks for visitors and guests and a lot more. Periodically shepherding is practised on loose sheep, which means the shepherd walks with the sheep flock when they graze over the wide-open heathland and meadowland. A dog or two controls the flock and the sheep are put in a safe place for the night. The thought behind Lystbækgaard is to create a centre for wool, crafts and sheep using both local and international wool and sheep contacts. The inspiration comes from England, Scotland and New Zealand, where sheep are used in tourism. Lystbækgaard can develop into a Danish culture, give inspiration and become a visitor centre. The farm opened Easter 2000 with a big wool exhibition promoting the primitive Nordic landrace wool and it’s possibilities. The area is a mix of remote heathland, windblown juniper trees and forestland - silence, which can nearly scare modern visitors. The heathland was in former days important for farming people in the area, a sign for both poor and richness. Lystbækgaard is run by volunteers that have an interest in working on the place and in the wool workshops. • Try carding, spinning, weaving, felting etc. June the 10-11 2000 Lystbækgaard was hosted the 2nd Danish spelsheep-meeting. Enthusiastic sheepholders from the whole of Denmark met for inspiration and exchange of ideas and creative thoughts and experiences around this very special breed. The wool and it's endless possibilities were on display/show - 200 people visited the farm. There was blade shearing and the visitors could follow the raw wool from start to finish on many of the working stand displays. 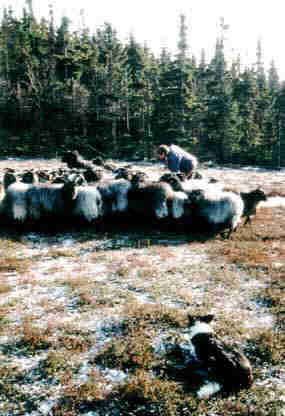 Out side was the pet lambs and wild spelsau, which were used in sheepdog demonstrations. Next year 2001, Lystbækgaard will prepare a similar spelsau-meeting. Feel welcome on the farm.